Our writers are scattered across the country, and represent a number of professions, though college teachers are probably the largest group. We do accept unsolicited manuscripts. Generally speaking, these are not opinion pieces but expository, personal, or exploratory essays, though we will review interviews or selected other genres on occasion. Almost any subject is possible. We are highly selective about personal essays of faith experience and about homilies. Our review columns (film, popular culture, music, and so forth) are supplied by regular columnists. 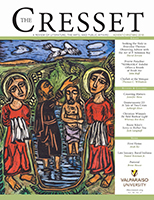 Our readership is educated, most with some church connection, most frequently Lutheran. Articles should be aimed at general readers interested in religious matters. 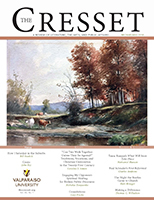 Before submitting a manuscript, you may want to contact the editor at cresset@valpo.edu about the suitability of your topic for the journal. The editor's agreement to review a manuscript does not guarantee acceptance. Invited submissions must meet our publication standards before they will be published. We prefer to receive all submissions through Submittable. 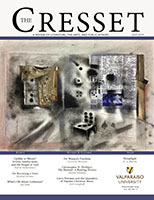 Manuscripts may also be emailed to cresset@valpo.edu. Due to the high volume of submissions, poetry submissions will not be accepted via email. Notes, citations. The use of notes is discouraged. Notes of supporting citations should be placed in parentheses in the text, listing (in order): last name of the author, year of publication, and page numbers where appropriate, e.g., (Basil, 1934: 232). Subsequent citations of the same source should also follow this model. In a separate section entitled "Works Cited" list alphabetically by author (and, within author, by year of publication) all items that are cited in the text. Give complete bibliographical information, including author's first name, publisher, and place and date of publication. Bass, Dorothy, ed. Practicing Our Faith: A Way of Life for a Searching People. San Francisco: Jossey-Bass, 1997. Wright, Basil. "Filming in Ceylon." Cinema Quarterly 2/4 (1943):231-32. _____. The Long View. London: Secker and Warburg, 1974.